Simply stated; the pastor/teacher (who serves as instructor) will present a lecture using the Bible Institute materials and then assign several pages to be completed in the student workbook. Or, the pastor/teacher can conduct a distance learning school from the church. Students do self-directed studies and meet to share and discuss. This program goes beyond typical Bible studies in that there is additional study required of the student as well as assessment and feedback of the student learning. 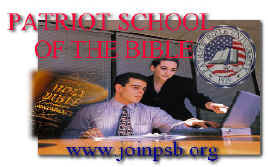 Your students can even go on to earn a Bible degree from Patriot Bible University without leaving your church!. Using these courses will reward you with growing disciples stepping into leadership thereby strengthening the local church. The courses have been expertly prepared and organized to take a Believer from new convert to disciple to worker. How Is The Instruction Delivered? The curriculum is designed for self-paced, self-directed study. The classroom is used more as a laboratory for practicing what students have learned in their books. Students gather weekly or monthly to share what they have learned or raise questions for group settings. The teacher becomes a discussion facilitator for the student group. Group meetings start in prayer and worship followed by a pastor-led devotional. Students share what they have learned in their course. Students need not take the same course - they can study a course of their choice. Students who share will gain valuable teaching experience and listening students will be learning in these discussions. This process is the core of any vocational pursuit of ministry! Some churches offer a class during Sunday School and another before the evening service. Others use Wednesday night for a class before or after Prayer Meeting. Other churches have also set up extra "seminar-style" courses with a single class meeting for three hours on Saturday, then coming back several weeks later (with the workbook completed) for a final 3-hour session. Others do one class at a time, meeting for two-hours per session three times. Regardless of the schedule, each class should meet for a total of six hours, and all workbook assignments must be completed. Using the institute launch kit will minimize the work involved in starting a biblical higher education school at your church. You will be using a tested system. Guide for each subject to help minimize preparation. Students will use excellent Christian workbooks and text material. They will gain a foundational understanding by completing the workbooks. 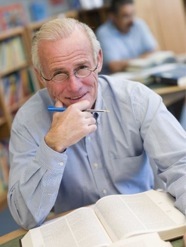 The pastor/teacher provides the motivation to learn through prepared lectures and quizzes. Students can acquire the pastor’s view of ministry and have their thinking stimulated by his insights. And the local church will benefit as students use what they learn to gain practical experience. Students will soon begin displaying signs of spiritual maturity as they increase their knowledge of Bible principles. Helpful & Time-saving Administration. The grader will use BibleInstitutes.org provided Answer Keys to determine student progress and achievement. Grades are recorded on preprinted transcripts bearing the name of your Bible Institute. 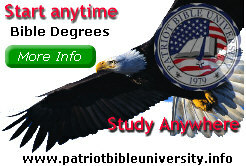 Your Students can "go on" to earn a Bible Degree by enrolling at Patriot Bible University. Patriot will accept your classes as transfer credits. Bible Institutes serves on your team as your doctrinally sound education provider using only Biblically sound courses. We will save you much time in curriculum research and lesson preparation. Institute Launch Kit Details - What's Included? Customized brochures are available to describe your Institute’s program and polices. Student application forms, imprinted with the name of your Institute, make it easy to enroll students. Record keeping and Institute policies and procedures are simplified using the pre-designed forms. The launch kit includes the Psalm 23 teacher kit. Lecture Format: Courses also require two or three brief review quizzes. Course grades are determined by attendance, along with workbook and quiz scores. Self-Directed Study Format: Students can be graded based on presentations and performance within the small group meetings, along with workbook completion. Practicum's or course papers can be submitted for pastor review. We've Made It Easy for you to implement and teach Higher Christian Education in Your Church.